This book focuses on speech processing in the presence of low-bit rate coding and varying background environments. The methods presented in the book exploit the speech events which are robust in noisy environments. Accurate estimation of these crucial events will be useful for carrying out various speech tasks such as speech recognition, speaker recognition and speech rate modification in mobile environments. 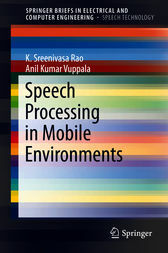 The authors provide insights into designing and developing robust methods to process the speech in mobile environments. Covering temporal and spectral enhancement methods to minimize the effect of noise and examining methods and models on speech and speaker recognition applications in mobile environments. K. Sreenivasa Rao, PhD is an Associate Professor, School of Information Technology, Indian Institute of Technology Kharagpur (IIT Kharagpur), Anil Kumar Vuppala, PhD is an Assistant Professor at the International Institute of Information Technology, Hyderabad (IIIT Hyderabad).